During the most vibrant elections ever held in the history of the BVI Volleyball Association where 16 persons vied for six positions, Willis Potter was elected association president during a general meeting held at the Department of Youth Affairs and Sports on last Wednesday. Potter who stated that the sport is ‘about to take off’ outlined the course he plans to take the sport on. Potter said when he attended Missouri Southern, he met with the volleyball coach who gave him specifics that he’s looking for, particularly with women. A 6 foot player who can reach 9ft 8 ins is what he’s looking for. The new president noted that over the years, the association has not raised funds and even collecting at the gate didn’t happen. He said at the beginning of the season, bring in a team from St. Thomas, St. Croix or somewhere in the Caribbean to pull a crowd will start getting interest bubbling. A small fee will be charged for maintenance purposes. The new head said he’d like to see a Men’s B Division added to the league similar to that introduced in the Women’s Division in 2016. The bottom team in the A Division is relegated to the B Division and the top B Division team is promoted to the A Division. Potter got the nod for the top spot over Stephen Payne. He will be joined by Al-Aumin Nibbs as as vice president; Kisheba Sprauve-Callwood who ran unopposed is the General Secretary while Anabelle Skelton-Malone garnered the bulk of the votes for Assistant Secretary over Amadonna Creece. Former president Sabinah Clement is the Treasurer and wasn’t challenged for the post. 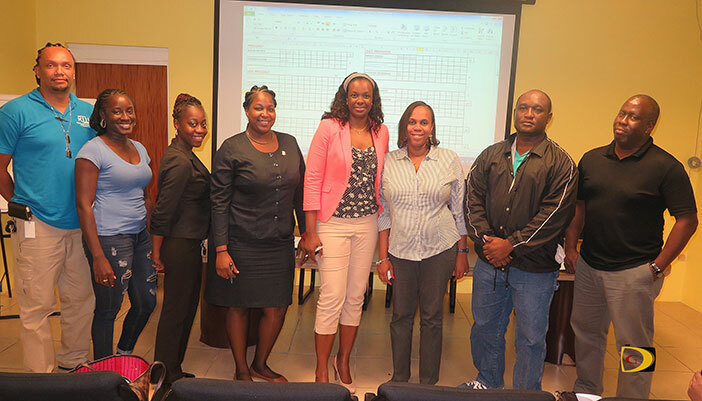 Maria Drigo got the nod as Assistant Secretary over Natasha Marshall, while Desiree Farrington topped Tamisha Georges and Natrice Peters as the Public Relations Officer. Henrietta Alexander and Curtis Davis got the nod as Athletes Representatives from the field of seven entrants.